I have always loved theatre, though I have no talent for it. I took one drama class in high school and it convinced me I’m better at writing stories than acting them out. But I still love to attend theatre productions. I also have a fondness for Shakespeare, so it goes without saying that visiting the Globe was high on my list of things to do in London. 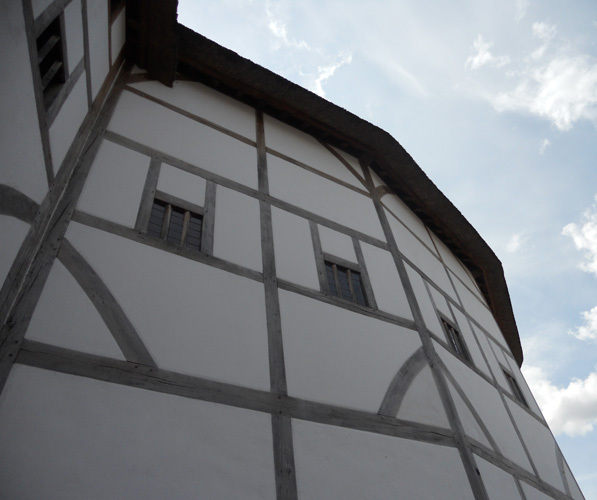 The original Globe Theatre was built in 1599 by Shakespeare’s playing company, the Lord Chamberlain’s Men. It was destroyed by fire on 29 June 1613. 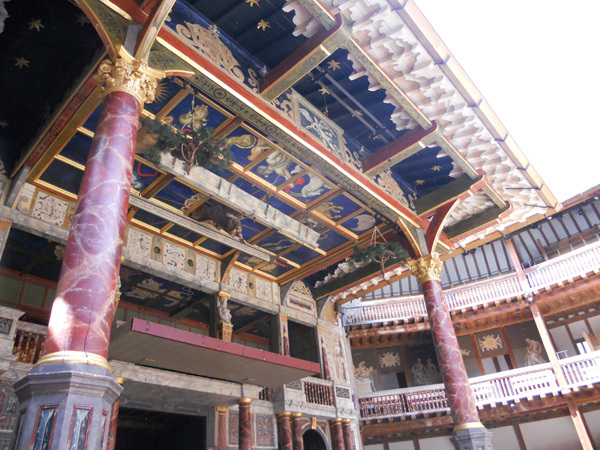 A second Globe Theatre was constructed in the same location in June 1614. But it was closed in 1642, like all other theatres in London, by the Puritans. It was pulled down in 1644 to make room for tenements. In 1997, American actor and director Sam Wanamaker completed his dream of building a modern reconstruction of Shakespeare’s 1599 Globe Theatre. It is located 750 feet (230 m) from the original location. Since the Thames was much wider in Shakespeare’s time, Wanamaker decided to construct his theatre on the river bank, to recreate the atmosphere of the original. 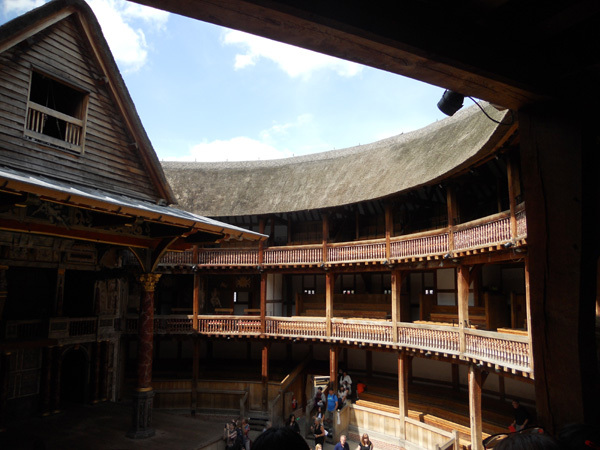 The reconstruction (often referred to as ‘Shakespeare’s Globe‘) is slightly smaller, seating only 1400 spectators compared to the original theatre’s 3000. The build team tried to stay as close to the original building as possible, though some modern modifications had to be made (for safety reasons). The entire building is built from English oak, with mortise and tenon joints, making it an ‘authentic 16th century’ building. No steel reinforcement was used on the structure. The Globe has the first and only thatched roof permitted in London, protected by modern fire retardants and a sprinkler system. 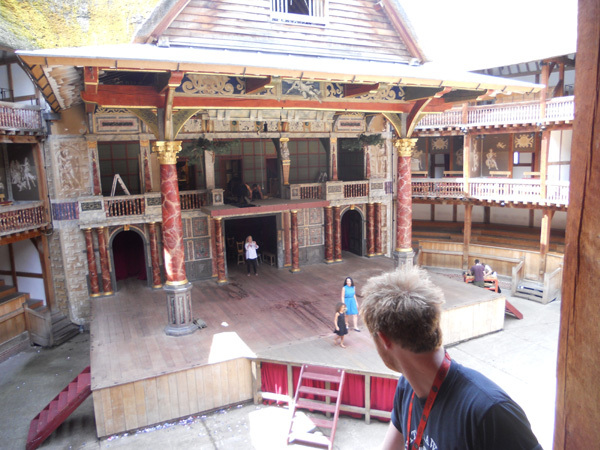 The Globe is an open air theatre, so if you’re standing in the pit and it rains, you get wet. Much of the tour centers around the history of both Shakespeare’s globe and its replica, including a discussion of the devastating affects of several attempted performances of ‘The Scottish Play.’ My theater major friends will be somewhat dismayed to hear that someone blurted the name Macbeth, as soon as the topic arose. The tour, unfortunately, does not allow you to go backstage, as there are regular productions being prepped during the day. We did get a glimpse at the preparation, however, including a (fake) deer hanging from the rafters. Standing in the pit, you get a real sense of the imposing power of the stage. I wish we had a chance to see a play at the Globe before we left but, unfortunately, our schedule didn’t allow it. 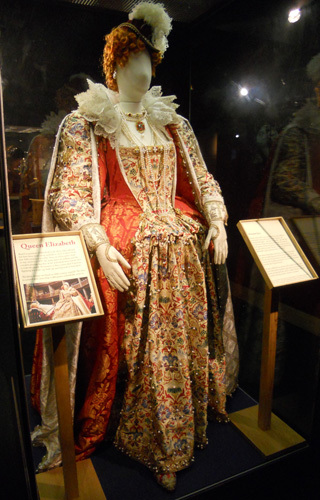 Aside from the tour, the Globe includes a small museum including costumes and props that have been used in performances. Some have detailed descriptions explaining the fabric and decoration choices, as well as the various layers the actors wear. While we were visiting, our tour guide also told us about the Sam Wanamaker Playhouse, a replica candle-lit Jacobean playhouse which has since opened. I enjoyed our visit to the Globe, brief as it was. I also purchased The Pocket Shakespeare, a pocket-sized guide to Shakespeare’s plays and their characters that I can keep in my purse. Have you had an interesting theatre experience? Share it in the comments!